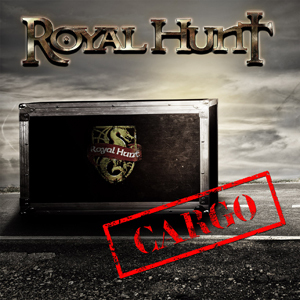 Frontiers Music Srl is pleased to announce the release of ROYAL HUNT's new live album entitled Cargo on March 18, 2016. Following the release of their latest studio album - Devil's Dozen – ROYAL HUNT participated in three widely known Festivals around the globe in the fall of 2015: ProgPower USA, Loud Park Japan and Rockingham UK. They performed their energetic brand of symphonic/progressive yet highly melodic and instantly accessible Royal Rock for thousands of appreciative fans. While ROYAL HUNT's next tour – set to the spring of 2016 – is being announced (see dates below), the band found the time to gather in the studio and pick out the best performances recorded during their festival trek: an hour and a half of ROYAL HUNT's trademark sonic assault, skillfully captured on tape. Why live album and why now? "Well, mostly because we haven´t released any live recordings for – roughly – 10 years or so." says keyboard maestro and principal songwriter Andre Andersen, “2006 was great and many fans consider it to be our best (some will pick 1996 or Closing The Chapter as their favorite) but anyway – it´s been awhile, so we assumed that it might be interesting for you to check out our “new swing” at this live set. Just think about it: last time we recorded Paradox live was almost 20 years ago! Add a few new songs, the excitement of the festival performance, a couple of new faces to the line-up and – all of a sudden – things are sounding quite a bit different. We´d say it sounds fresh but let´s see what´s your opinion on this matter will be." The album includes a complete rendition of their signature concept album Paradox. ROYAL HUNT released 13 studio albums and their name stands for quality Symphonic/Progressive Metal.